These three civilizations—what we might call the “Three Cultures”—each contributed something unique to European culture, the culture which was the foundation for our American culture. And the most important thing they contributed was the idea of what a human being is. The Greeks represented philosophical and artistic man. Alfred North Whitehead once said that “all philosophy is a footnote to Plato.” Plato was Socrates’ student, and Aristotle was Plato’s. Dante said of Aristotle that he was the “master of those who know.” And it wasn’t only philosophy in which the Greeks excelled. 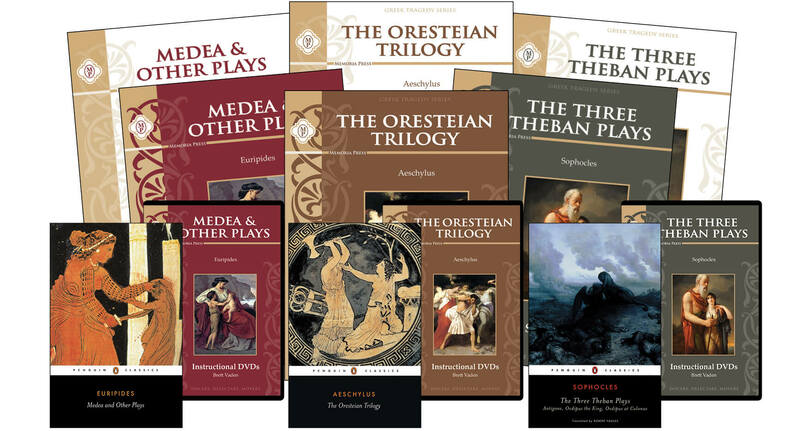 With the possible exception of Shakespeare, there are few poets to equal Homer, and perhaps no playwrights comparable to Aeschylus, Sophocles, and Euripides. In many ways the Greeks can be said to have invented philosophy and art as we know it—and to have raised it to a level rarely rivaled since. The Greeks were humanists, a term we Christians often view with undue severity, partly because of the prevalence of the term “secular humanism.” But secular humanism is not the only kind of humanism. I was recently in a panel discussion on classical education and one of the other panelists, when asked what was wrong with modern education, said, “Humanism.” Humanism is exactly what is not wrong, either with the modern world or with modern education. In his book The Everlasting Man, G. K. Chesterton speaks of the sophistry that drives much of modern secular thought, a sophistry that works “first to soften the sharp transition from animals to men, and then to soften the sharp transition from heathens to Christians.” In other words, there are two distinctions essential to the Christian view of the world: that between man and beast, and that between God and man. It is these distinctions that modern thought obfuscates. And while the Greeks did not understand the relation between the human and the divine—as evidenced by their own gods, who were merely men writ large—much of their philosophy and art reflected the subcreative imagination of beings made (though they did not know it) in the image of God. The humanism of the Greeks was remarkable for its belief in areté. This word has many shades of meaning, but it generally has the sense of some kind of human or moral excellence. To have areté was to live life according to one’s essence or nature: It was the art of being human. Of course this assumed some kind of human ideal to which men were expected to approximate. The closer they approximated this ideal, the more they were thought to have areté. The Romans knew the Greeks to be their cultural superiors. They conquered the Greeks militarily, but intellectually and culturally the conquered were the conquerors. Well-to-do Romans sent their children to boarding schools in Greece to be educated, or employed well-educated Greek slaves to tutor them. And, like Russians in the nineteenth century who bowed to superior French culture and often spoke French in their homes, Greek was often spoken in Roman homes. Consequently, the Romans imbibed much of Greek culture and made it their own. The Romans, too, believed in a human ideal, although its makeup was slightly different from that of the Greeks. The Romans, like the Greeks, were humanists. The Romans called this human ideal humanitas (literally, “humanity”). The old Romans were people of civil order, and filial and sacred obligation. Unlike the Greeks, who speculated about the idea of the Good, the Romans were people of practical virtue. They brought Greek philosophy down to earth. 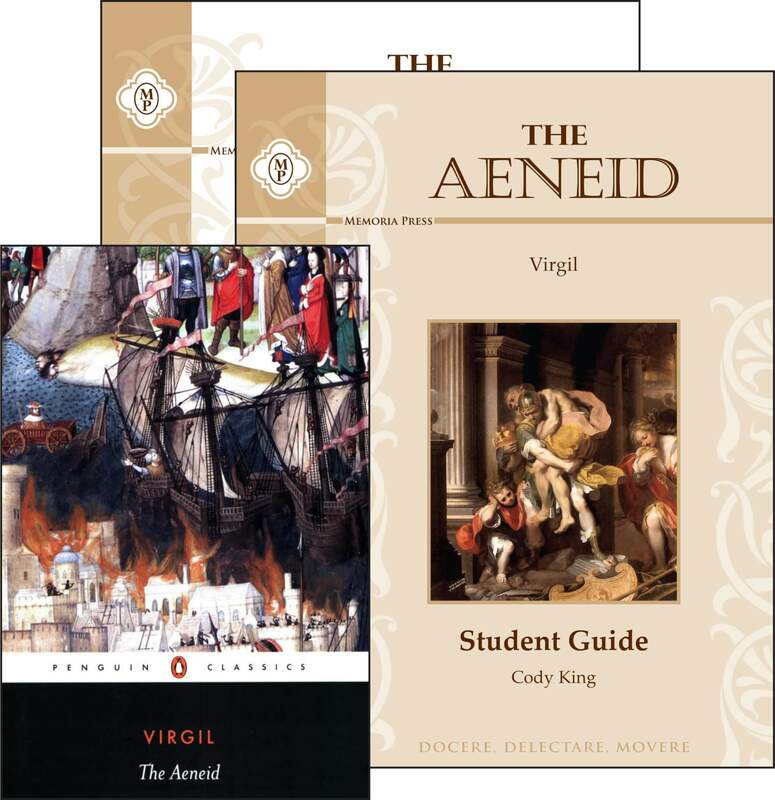 Theirs was an ethical, more than an intellectual, culture, with Aeneas as their model. He was known to schoolboys as “Pious Aeneas” up until the beginning of the twentieth century. He was a Trojan prince who, in Virgil’s epic Aeneid, flees the burning city of Troy, his father on his back and his family in tow, and who founds the “new” Troy on the banks of the Tiber River. If speculation was the watchword of the Greeks, it was order, both civil and moral, that characterized the Romans. But to this recipe for Western civilization, we must add the ingredient of the Hebrews. If the Greeks exemplified speculative man and the Romans practical, the Hebrews exemplified spiritual man. We look to the Hebrews to see how God deals with individuals and with nations. The Greeks speculated on the nature of wisdom and virtue; the Romans attempted to practice these ideals; the Hebrews alone among men knew their Author. The Greeks and Romans were the stepchildren of truth; the Hebrews were its natural offspring. Christianity came organically out of Judaism. But when the classical, pagan cultures of Greece and Rome were subsumed into Christianity, the fathers of the Church did not reject the best ideals of these cultures. The cardinal virtues―justice, temperance, courage, and prudence―were fully accepted by Christian thinkers, but at the same time they saw the insufficiency of these. To the cardinal virtues of the ancients they added the theological virtues: faith, hope, and charity. Rather than rejecting the concept of an ideal man, the Christians informed the concept with new life. While this human ideal for the Greeks and Romans was embodied in characters in stories written by men, the Christians could appeal to a character in a story written by God―a character who was not only real, but God in human flesh, the second Adam. The problem with classical humanism was not primarily that it was wrong—though it was in some cases—but rather that it was incomplete. This is something that we forget at our peril. It is not wrong to say that man is the highest and noblest of earthly creatures. He is, in fact, made in the image and likeness of God, and therefore he is all this―and more. The Greeks understood the proper metaphysical location of man―above the beast and below the divine. He was, as religious historian Mircea Eliade pointed out, the one animal who walks erect—a sign of his higher possibilities. The gods of the Greeks were ill-conceived: products of their imaginations and projections of themselves. They worshiped deities made in their own image because they had no access to the revelation of the God in whose image they themselves were made. They had no revelation other than natural revelation, which could only take them so far. When Chesterton said that Christianity was the “fulfillment of paganism,” this is what he meant: Not that Christianity was merely a further development of ancient paganism, but that Greek and Roman thought was the stunted form of a Truth that could be perceived but not truly known or understood until it was revealed in the full revelation of Christ. This is what Lewis meant too when he said that, in relation to Christianity, paganism was as a virgin, and modern secularism like a divorceé. While the Greeks and Romans accepted truths they had no way of truly knowing, modern secularism rejects the truth it has no excuse for not knowing. Modern thought, being fundamentally Darwinian, rejects any real distinction between man and animal, asserting that man is merely an animal, and rejects any distinction between man and God, contending that God does not exist at all. And it cannot accept the concept of an ideal man because it does not believe in man (the ideal), but only in men. In fact, it rejects all transcendent truth. Humanism is not the problem with modern education and culture; it is anti-humanism—not believing in a human ideal. 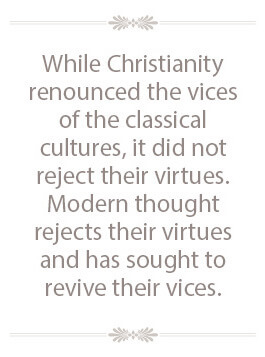 While Christianity renounced the vices of the classical cultures, it did not reject their virtues. Modern thought rejects their virtues and has sought to revive their vices. This is why classical Christian education is needed today: to bring a fuller, Christian humanism to a generation which has abandoned it altogether. Though I found this article very interesting, and as always, well written, I think the distinction between your definition of “humanism” and what you refer to as “secular humanism” may need further clarification. I would bet that the man who said that “humanism” is the problem with modern education was not referring to the humanism you describe, but to the Humanism that is a religion which has driven progressive education for nearly a century. The Humanists of the 20th century have taken this name for themselves. They have written manifestos, call their belief system a religion, and continue to proliferate in the 21st century. You can find their publications easily online. One place to start would be secularhumanism.org, as you noted in the article what Christians are really opposed to is “secular humanism,” but you could also find the americanhumanist.org and simply humanists.org. John Dewey, the “father of progressive education,” was one of 34 signers of the original manifesto published in 1933, and Charles Francis Potter stated in his book, Humanism: A New Religion, that “Education is the most powerful ally of Humanism, and every American public school is a school of Humanism.” It is clear by the title of the book that the Humanism of the American public school is that of a new religion, an anti-theist religion. I don’t think I disagree with any of this. I did attempt to make the distinction in the article in the limited space we had without sacrificing other things that I thought were necessary to say. But I hope readers will benefit from your expansion of that point. Thank you.